Today, when you order "Daniel Garcia Project LIMITED EDITION Signed and Numbered", you'll instantly be emailed a Penguin Magic gift certificate. You can spend it on anything you like at Penguin, just like cash. Just complete your order as normal, and within seconds you'll get an email with your gift certificate. 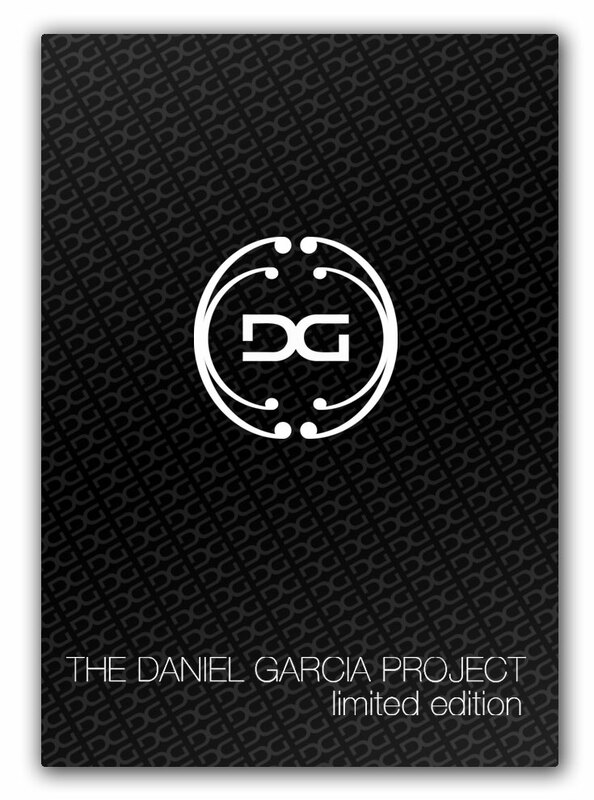 Daniel Garcia Project LIMITED EDITION Signed and Numbered (6 DVD Set) THIS. IS. BIG. Limited to 500 sets, each one is signed and numbered by Danny Garcia AND producer Paul Harris. ONLY 50 LEFT. MOST HIGHLY RECOMMENDED. Satisfaction Guaranteed: Starts where most All Backs Routines end, and then goes two climaxes better. Personal Safe: Coins across-into the spectator's hand. Plus a killer finish: the last coin changes places with the spectator's ring which actually vanishes from their hand. Twisted: Instead of wasting time on minute handling changes for the bill switch, Daniel improved the effect. Now you wave your hand over the bill, and it visibly changes to a hundred. Ego: How many card effects have one great new move? This one has two! You find the card the spectator's thinking of with the fastest card change you've never seen. If you don't have an ego, this will give you one. Third Degree: Use this only if you're prepared to really freak people out. You find a selected card by burning a cigarette through the deck-it stops on the selection. Rubber Made: A banquet of visual impossibility with a borrowed ring and two ordinary rubber bands. Daniel's killer routine has three phases and half a dozen visual miracles. Then the climax-you hold both rubber bands in your hands and openly toss one at the other, where they link, untouched, in midair. Unlink the bands and hand them for examination. Scatter: A mental and physical impossibility-a card trick that uses no cards. Your journey through the Daniel Garcia Project concludes with a final dose of mind-shattering effects. Some completely impromptu, some taking maximum advantage of devious preparation. As always, Daniel brilliant combination of unexpected methods and advanced canceling create visual new versions of some classic astonishments. Nacho Momma's Triumph: Features a surprise finish, now entirely in the hands. This will hook, reel in, and land all your magic buddies-add a little olive oil and they'll be completely fried. Needless to say, laymen have no chance. Quarters: A relentlessly impossible coin through glass routine. Includes the damnedest visual penetration: you drop a coin in the glass-it really goes in the glass-and it falls right out the bottom. Uses any glass. Windex: Draw a window on a signed card, then open the window to create a large opening in the card as well as in the spectator's brain. Leaves a permanently impossible souvenir. C.A.A.N. : Any card freely named is found at any number from 1-52. Totally clean. All in the hands. Mucho Easy. Joe Blow: Talk about packs small plays big... this impromptu wonder requires only a tiny scrap of paper and a spectator to witness a miracle. Over and over again, you wiggle your finger and cause a piece of paper to fall over. Every possible explanation is brilliantly cancelled. Warning: Some people will actually believe it's real (present company excluded). In 2005, Daniel Garcia started production on a 3 volume DVD set that what was soon to become an instant classic among the magic community. With highly visual effects, and off the wall techniques, The Daniel Garcia Projects became a must-have for a new generation of magicians as well as seasoned professionals. Now, with the help of Paul Harris and the Buck Twins, Garcia has signed off on the final chapters of his new set. 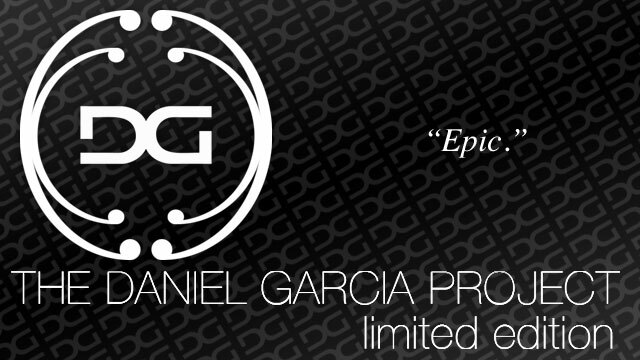 Welcome to the much anticipated release of:The Daniel Garcia Projects volumes 4, 5, and 6. William Tell:Show your archery skills by causing the Ace of Spades to pierce the deck finding a previously selected card. Complete with a "Kicker Ending" and an alternate handling. Jacob's Ladder:Watch as a single dollar openly and VISUALLY penetrates a rubber band being held by the spectator with NO COVER and without the magician even touching the bill. The DG Box Steal:Learn a new utility move that will change your card magic forever. The OG Transpo:The magician secures a selected card in a card box and under the spectators hand only to cause it to change places with another selected card instantly. No extra cards, no dupes, and not to mention, both cards can be SIGNED. Scorch:Fire and card magic at its best. Watch as a candle flame slowly vanishes and finds a signed selection by magically scorching the back of the card. iCard:Included on this dvd is the bonus files for Daniel Garcia's signed card to iPhone. NO APP NEEDED. Party Perception:Be able to divine a mentally selected word from a beverage container without the use of any prying questions. Void:Daniel Garcia's completely impromptu handling of Timothy Wenk's MISLEAD. Cause a drinking straw to visually penetrate a dollar bill 3 times, with the last phase being held by a spectator. 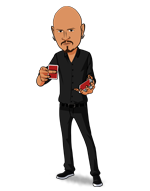 In Visible Monte:Perform the classic 3 card Monte all in-the-hands and with the "money card" FACE UP. Complete with an unsuspecting added climax and alternate ending. Lotto:Visually change a winning lottery ticket into cold hard cash and show each bill 360 degrees. The Airbrush Change:a modern and fine-tuned handling and medley of Marlo's Face Up Startler Change and Roy Walton's Paintbrush Change. Math:Two, and ONLY two, quarters jump from hand to hand and then visually morph together in mid-air changing into a half-dollar. The Gambler's Swap:Watch as a 4 of a kind magically change places with a 2 of a kind in a spectators hand. Fire and Smoke:Learn Garcia's version of the classic "Oil And Water" effect. Cause 3 red and 3 black cards to separate and un-mix with no extra cards and apparently no sleight of hand. Complete with a FULL DECK un-mixing that the SPECTATOR shuffles. V.I.S.A:Visual Instant Static Attraction. Instantly cause the magnetic strips on two credit cards to ACTUALLY become magnetized, attracting and repelling each other. One Point Production 2.0:An extremely visual production of a single card that can be performed all in-the-hands! Pop:Magically cause a signed playing card to appear INSIDE of a balloon that the spectator has inflated and is holding. Ham and Cheese 2.0:A revamped version of Daniel Garcia's classic effect "White or Wheat" all done in the spectators hands! Magically cause a signed card to appear between two jokers INSTANTLY and VISUALLY. Static Sandwich:A magical combination of "V.I.S.A" and "Ham and Cheese 2.0" where a selected card visually flies out of the deck and is caught between the two jokers as if attracted my a magnetic force. On The Rocks:One of the most visual coin through glass effects you will ever learn with NO EXTRA coins! Tric-Tac:Visually change the color of every single Tic-Tac in the container and IMMEDIATELY let the spectator examine everything. The OK Coin Vanish:Seen on volume two of The Daniel Garcia Project, but not taught, now learn Daniel's one handed coin vanish. Complete with alternate handling. For penguin costumers that already have Symphony and Five. I know those poeple don't want to buy the same tricks again. I also have both of them but still have bought this one. It is because you will see him perform in public. (You can see how he handle the tricks in public). So you can improve your skills on how to perform with poeple of the streets. So if you have Symphony and Five you will still love this one. And for this price just buy it. It will cost more if you buy it serperated. (theory 11 have them serperated but only in download form so not signed). Note for the fans I got the 255 edition so order fast they only have 500 signed. And I have told penguin to pack it very good because of the review below and the order that I have placed before I bought this DVD box. And they did so thank you penguin. 48 hard-hitting, visual, reputation makers. Most of them are impromptu, on-the-spot effects. Not only do you learn the powerful titles, you're smothered with a whole bunch of sleights and subtlties that you WILL use EVERYDAY. The discs also come with a load of PDFs containing no-app-needed iPhone/iPod Touch effects, the template for Lotto (one of the simplist and most effective bill switches i've seen to date), and tic-tac (and incredibly VISUAL change). Wheter you're a beginner or a pro, these tricks are definitely something to add to your arsenal. Although the teaching in volumes 1-3 is somewhat rough (but still very good), volumes 4-6 more than make up for it. Easy to understand, and over-the-shoulder, slowed down teaching. Even just watching Danny walk around and interact with the locals will have you on the floor laughing! If you think it's overpriced, think about it this way. 48 tricks for $175 means less than $4 per trick! The discs come in a very sleak box set complete with both Danny and Paul Harris's signatures! Magic collections don't get any better than this! The effects on this DVD are certainly worth the price of this set. The DVD collection is awesome, well worth the money and I'm glad I got in on this collection. The tricks are also awesome and the teaching is done very well. Some of the stuff is a little difficult but well worth it. As for shipping my set came damaged and I've sent it back to Penguin for replacement (should have it back soon I hope). Sad to say I also just got another order in this week and it too had damaged product from shipping. I seriously think Penguin needs to invest a little time in packing the products. Two out of two orders has showed up damaged and both times I've requested the stuff shipped 2nd day air. My next order will request they at least add some packing material to the box. I would rather have good packing over the candy they send in the box. Overall everything I've bought has been a good product, just damaged from shipping. I have alot of magic dvd's, but this set is amazing! If you want some magic that will make your spectators mouth drop open and saw "What the heck?" this is a GREAT collection! If you have ever seen Daniel at a convention you know that his magic is top notch. Don't miss out on this great collection of his dvd's! (FYI.. I already had vol. 1,2 &3, but bought the set anyway!) This is magic you can and will do! Get it before they're gone! I found it hard to part with the cash but i've found it very worth it, great impromptu tricks not the perfect ABSOLUTE beginner set but if you've even dabbled in magic for a short time I'm sure you could pick these tricks up. Some require extensive practice others don't. I'm pleased with my purchase. The Ego slights and the O.P.P. have been adapted to my repitoire as well as various renditions of the Air Brush change. Great Set, funny moments. Like others have said the first 3 dvds' production value doesn't equal the second 3 dvds but is still good enough to get the teachings across. This DVD set Is incredible. The idea's on it are very creative and most are impromptu. It comes with 48 tricks in total and each one is worth the money. This DVD is cheaper than buying all of the DVD's separate, and you get it signed and all in one case. So if your a fan of creative tricks and love Daniel Garcia then this is for you! You learn stuff from this dvd!!! This is hands down, my favorite purchase from penguin magic. My favorite magicians are Daniel Garcia and Greg Wilson. i own almost everything from both of them. And this one does not disappoint. Daniel Garcia is an amazing teacher, and his style is awesome. Some of the stuff he does is unreal. one of my favorite parts is when he goes up to a random spectator and he's like "im gonna call him bill the entire time" and the whole time the guys like "thats not my name" and daniel is like "sorry bill, so anyways" its great. Almost every trick i will be learning, just be ready to put in hours and hours and hours of practice to make it look beautiful and amazing like he does!